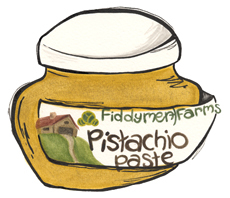 Pistachio Paste for sale. Buy online at Zingerman's Mail Order. Gourmet Gifts. Food Gifts. From Fiddyment Farms outside Sacramento, California. They’ve been growing pistachios since the 1960s when the nut first came to California. They dry their pistachios within minutes of harvesting, a very important step since the nuts can spoil quickly after being picked. The fast drying captures the nutty sweetness of the pistachio without any of bitterness often found in lesser quality nuts. All that flavor comes through in this paste. Made from 100% pistachios and nothing else, it’s wonderful in baked goods, pastries, over gelato or even tossed with pasta and some good olive oil. Replace peanut butter with pistachio paste for a whole new twist on PB & J.